In a world where Tweetdeck and Hootsuite allow you to slice and dice Twitter by hashtag, search term or trend, why would you need something like Twinitor? Because there are times when tools like Tweetdeck and others just give you far too much information. Twinitor, on the other hand, adheres to Twitter’s basic principle of being simple – and that feels priceless when you’re just trying to follow one big story. Recently, I found myself pitching in to help the Birmingham Mail when there was severe flooding in an area called Streetly. Searching for Streetly, and the name of the reservoir which was near to the flooding, provided load of information via Tweetdeck and others – but it was hard work to look at it quickly and get information. Where Twinitor came into its own is that it is easy to remove retweets – a big bonus – and it colour-codes tweets for each search term you are using. Pictures are also displayed within the tweets – where they have been posted – and you can also filter for just tweets with images. The simple trick of just using one screen, and putting big crossheads in saying ‘one minute ago’, ‘five minutes ago’ and so on makes it easy to use, and easier to be sure of sources. Both of which are priceless when working on a big, breaking news story. Social network dominating your work day? Out and about and worrying you might miss the things people are talking about? Two daft questions but a half-serious point – Twitter is real-time, and Facebook is going that way … what are the odds you might miss something interesting? This is where Summify is a rather handy safety net. I know there are other social network aggregator-type tools which present themselves as some sort of newspaper os stuff, but there’s something about Summify which I really like: It’s meant for you, not others. So instead of pushing out a link on Twitter to all your followers showcasing the followers you’re interested in, Summify goes through your timeline, finds the most shared and talked about links and information and packages them up into one daily email. That email can be viewed in your inbox, or you click on a link and it serves up a nice visual display of the best stuff in your browser. Oh, and it does the same thing for Facebook. It really is rather nice. Ok, so we have Hootsuite and Cotweet when it comes to sharing access to ‘group’ Twitter accounts such as the brand accounts of newspapers or the main accounts of local councils. They are fine – but what if you are on the move? Odds are your mobile or tablet is set up for your personal Twitter account – so trying to log on to the group one is a bit of a faff. Or how about if you’re doing a bit of liveblogging via Twitter with multiple reporters? Aggregating Tweets via a Twitter widget or a Coveritlive embed works very well – but what about those following your activity on Twitter? Should they really have to follow all of your reporters individually to get the full picture? Here’s an interesting solution: Birdherd. It’s a tool which allows you to be logged on to your personal Twitter account but post comments on your group account via a direct message. Log on to Birdherd, select the people who want to be able to post comments to your group account and you’re off. So if I was taking part in a liveblog for the Liverpool Echo, I’d send a DM to the Liverpool Echo main account, and it would appear in the account of the Liverpool Echo repeating my message with a /via@davidhiggerson at the end. There are also ways to send replies on behalf of the group account and DMs on behalf of the account but this is where I get a little scared – there’s too much scope for stuff to go wrong. Perhaps you can have too much of a good thing. But for making it easier to keep your brand/group account updated on the move and at the centre of liveblog action, then Birdherd feels like it is a great tool. There are a slew of social media monitoring tools out there – and there may well yet be more in the Advent calendar – but The Archivist is a little different. Sign in with your Twitter account and select a keyword, hashtag, brand or other search term and The Archivist trawls Twitter for the last 500 tweets containing that phrase. The archive will then regularly update over the following days, creating a useful overview of a particular term which you might be interested in. The longer the archive exists, the more useful it becomes. Over time, I’ll be able to tell the days when people were talking about @birminghammail most, for example, which can then provide the catalyst to see what was special about that day. It also provides the top users of a chosen phrase – are these people your brand needs to target, are they champions of you or your subject, or harsh critics? A handy piechart also shows the volume of retweets mentioning your search term as a ratio of overall Tweets – a good way of telling if your brand is gaining traction. Of perhaps more use to reporters is a list of common phrases used alongside a search term – a good way of perhaps coming up with other searches to try to get information. The sixth chart above is also telling for journalists – the sources of Tweets. If Twitterfeed is overwhelmingly dominant – which it isn’t in the case of the Mail – then your brand is pushing out a lot of tweets automatically but being ignored, while the presence of Tweets which began on the ‘tweet button’ would tell you have effective social sharing on your site is. A good all-round tool which provides retrospective social media monitoring – something which is surprisingly useful in the age of real-time interaction. Most Twitter users will be familiar with twitpic and similar photo-sharing tools, but what if you want to share a document? That’s where twileshare comes in. It allows you to log into Twitter and upload pdf and doc files in addition to jpgs, pngs and gifs. Obviously some of those image formats are covered off by Twitpic, yfrog and similar. So when would you use Twileshare? I see it as a handy tool for crowdsourcing – say you have a council report you want people’s opinions on, or a background document from a health authority which you want to link to to support the line you’ve taken on a story. It could also be a much more simple way of sharing a document than uploading it to a site or blog and the manually copying and pasting the link across. It’s pretty much a given that, as a journalist, you should be having conversations on multiple networks at any one time. But what happens when you read to refer back to a comment made by someone? The downside to real-time social conversation is that an interesting conversation can soon find itself buried by more recent events – if you can remember which network you have the conversation on. You see stories based on Tweets appearing online all the time. Often, they’ve begun life in print and are therefore less than interactive online. Doing screengrabs of Tweets is one way to show the ‘evidence’, but embedding it is even better. For this blog, I use the WordPress tool Blackbird Pie, which serves up a Tweet as it appears on Twitter – but I’ve started to like Socialditto more. Why? Because it makes it possible to embed Facebook statuses too. To get the embed code to embed the status from either Twitter or Facebook, you just need the URL of that status update, which can be found by clicking the time the update was made – normally listed as how many minutes or hours ago it took place. Copy that into socialditto and it serves up embed code, ready to be used on a website. The user can then click on the status update to go to the person’s profile, and maybe even start talking with them. It’s a way of making an article part of the social media discussion – which is pretty fundamental if the story is based on a social media discussion in the first place. During the Facebook documentary on Sunday, the comment was made that ‘When people are on Facebook, they are in discovery mode.’ The point that was being made was that, unlike users of a search engine, users of Facebook don’t know what they’ll find so have quite an open mind. Linknotify is a Facebook-only tool which takes that ‘discovery mode’ principle to an extreme – decluttering everything so that all you are left with are the links people are sharing. On one hand, it perhaps spoils the original point of Facebook, but it can be a really useful tool for journalists, particularly if your ‘friends’ include work contacts. The tool also has the ability to select just those links being shared by friends and those being shared by pages you follow. In that sense, it’s a kind of RSS for Facebook – and a good way to quickly digest a lot of content at once. Well worth a look for all journalists. There’s using Twitter and using Twitter. And if you want to be using Twitter in a way which is super efficient, then you need to be doing more with Twitter lists – the tool which enables you to build mini-communities and segregate Tweets by topic, location or theme – in fact, any way you want to cut it. The only thing with creating lists on Twitter is that it’s a bit clunky and, well, it can be a bit of a hassle finding the right people to add to that list. So if you’re a journalist covering, say Redcar, it can be a faff searching for tweets saying Redcar, and then deciding whether to follow them. And that’s doubly difficult if you want to follow people from Redcar talking about Redcar. Say hello to Formulists, a brilliantly simple tool which takes the hassle out of building lists. When you log in, you choose what sort of list you want to build – do you want to work just within your followers and those you are following, or search Twitter in general, for example. You can then search by words used in Tweets as well as references made in biographies and/or locations. Interested in people talking about the NHS in Liverpool? Easy. There are loads of other ways to get stuff from this tool. Found one useful person and wanted to find similar useful people? You can do that too. You can also see which followers you interact with the most – are you in danger of spending too much time talking to colleagues, for example – and also see who is adding you to lists (although you can also do this through Twitter). This is one of those tools which actually makes using Twitter easier than using Twitter itself. There are a lot of Twitter visualisations out there, but this one manages to combine looking good with also being easy to use and, perhaps most importantly, useful. Log on to Mentionmapp via your Twitter account and then select type in your name into the search box and it brings up a brilliant visualisation of the people you’ve talked to and the hashtags you’ve been using. You then click on those people or hashtags and Mentionmapp weaves out again, revealing the people they’ve been talking to or the other people who’ve been using that search term. It’s a fun, and practical, way of finding new people you should be following by simply mooching through your Twitter followers and going into their networks too. Here’s a tool which helps put the social back into social network. whotweetedme.com allows you to paste in a link, and it’ll come up with a list of people who tweeted or shared that link. It can work for specific URLs or generic domains – I tried the main homepage URL for this blog and it came up with the list above. Why so social? Simple – it makes it very easy to thank those people who’ve retweeted you, listing people in order of influence (for influence, read number of followers). To that end, I owe thanks to @paulbradshaw, @edwalker_86 and @getgood at the moment – so thanks! Seriously though, it’s also a useful way to see the people/brands who are sharing your stuff – perhaps making them the people to start building strong relationships on Twitter. Here’s a tool which might look a little basic design-wise, but is certainly very, very useful. It does a variety of things in terms of looking at your followers – and the followers of other people – but two things stand out for me. The first is the effortlessly simple biography search which pulls in results from any reference in the biography. You have to subscribe ($15 a month) to activate the ‘follow’ button to the left of each name, but as a way of sifting through people on Twitter to find potential new people worth following, it’s still worth doing. The second thing I particularly like is a bit geeky, but still has the power to be useful. It’s a tool which will compare the followers of up to three Twitter accounts and present them in a venn diagram. A bunch of results come up. 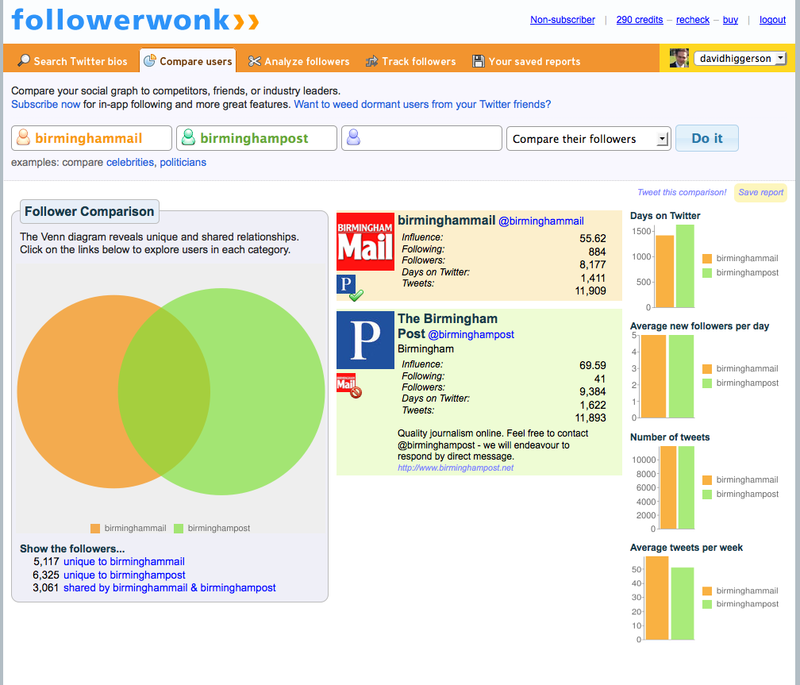 In this case, I’ve compared the @birminghammail and @birminghampost accounts to find out how much overlap there is. Around 3,000 people follow both accounts, while over 6,000 follow just the Post and 5,000 just the Mail. This tells me that the two titles are attracting different audiences – something which could be very useful when planning future content. I could also compare competitor brands to work out who my brand should also be following, especially as the results come up based on ‘influence’ – probably based partly on number of followers. A number of graphs on the right – comparing the number of new follows each day, the number of tweets per day and average tweets per day – are also useful. All in all, a very handy tool. This tool is amazingly simple in its scope but absolutely ace. Arrive at work, log on to email and receive update on all the times a word, phrase or hashtag has been used over the last 24 hours. As clear, simple and effective ways of keeping tabs on Twitter, it’s ace. Ok, it removes the instant, real-time aspect to Twitter, but for journalists who cover a patch made up of many communities, sometimes it’s just too much to have Tweetdeck rolling along in the background. It also has the ability to be really useful for keeping an eye on how a brand is being discussed – especially if you take into account that people aren’t always talking to you when they are talking about it. As I said, simple but effective. This, of all the 24 tools in the Advent calendar, is probably the one many people will have heard from. I’ve certainly blogged about it before. The reason for mentioning it again, then, is because it seemed to disappear for a while, but has recently returned. As Twitter tools for regional journalists – especially patch reporters – go, it’s got to be one of the most effective. It allows you to search for people based on the location they’ve put in their biography or on other details they’ve put in their biography. You can also search on what they’re tweeting about – so creating a combination of tweet search and location search – potentially very handy when a news story is breaking. Imagine you were covering the Birmingham Riots again – a tweet search would have brought up thousands of references, largely from people who weren’t there, but were sharing second-hand information. Locafollow, I think, makes it easier to find people who are witnesses to something. Here’s another useful tool for tracking down new followers. Twiangulate does a number of things, including comparing the followers of two or three accounts, which is a good way of working out whether you’re generally just talking to other journalists on Twitter, or talking to a wider community. It will also tell you who the most influential followers of several accounts are – meaning you have the chance to find out who you should be following in the hope they’ll follow you back. But perhaps the best tool within this website is the ‘keywords’ search (above). It allows you to specify an account – in the example above, I’ve used Rossendale Council’s Twitter account – and select a keyword from the biography of the followers. I chose the word ‘Rawtenstall’ – the name of the main town in Rossendale, and of 1.005 followers of the council’s account, i get a list of the seven people who say they are from Rawtenstall. This could be particularly useful when looking for followers among big accounts, such as football clubs. It even has a button at the bottom to turn the results into an instant list. Twiangulate takes a while to understand, but it’s worth it if you want to be following useful, powerful people relevant to your area of work. Listorious is want crowdsourcing is all about. It’s a tool which makes it easy to find people on Twitter. There are millions of Twitter lists on there, powered by, according to the company, data from the tens of thousands of list curators. Once you find the right person, you can interview them by asking questions over Listorious. But the lists stored on there are also worth exploring. It didn’t take me more than a minute to find one which contained a list of people from Birmingham. So as tool for finding people around a specific subject – great for finding a ‘boffin’ – it’s great, while the lists are simple to explore too. And, once you’ve found a list, you’re only one click away from following them too. Dabr certainly isn’t a new Twitter tool, so why include it on the list now? Simple – it solves a problem it was perhaps never intended to sort out: How to use Twitter if your internet connection at work isn’t the best. I know of newsrooms, often in rural areas, where internet connections or network configurations mean that ‘proper Twitter’ takes an age to load – and downloading and running Tweetdeck remains a daydream. Of course, the solution is better broadband connection, but in the meantime, Dabr – designed for use on mobile phones and therefore, by definition, much ‘lighter’ to use – solves a big problem. There are a lot of mobile Twitter tools out there – including Twitter’s own mobile service, but none are a patch on Dabr, in my opinion. Particular strongpoints are the auto showing of linked-to pictures within the timeline and a simple one-line navigation bar which makes it simple to click between retweets, replies, direct messages, and search. Trends – configurable to certain area – upload pictures and lists are also available. As I said, Dabr isn’t new, but just because a tool is established shouldn’t mean it isn’t still worth shouting about. I know of several council press offices (and at least one housing association) where this tool meant for mobile could be the best desktop client available. This tool is a bit of fun, but also very useful if you are a regional journalist, or someone who manages the Twitter account of an organisation which is located in one particular area, such as a council. Ask the questions “What sort of audience is really useful to me” or “What sort of audience am I really useful for” and it’s likely the word ‘local’ will come back as one of the definitions. After all, there’s not much point being a reporter in Bradford telling people on Twitter about Bradford stuff if half of your followers are living in Texas. Yet that’s the scenario some people found themselves in when they tried to build up their follower volume quickly with one of the ‘get lots of followers quick’ tools. Big audience isn’t always best audience. 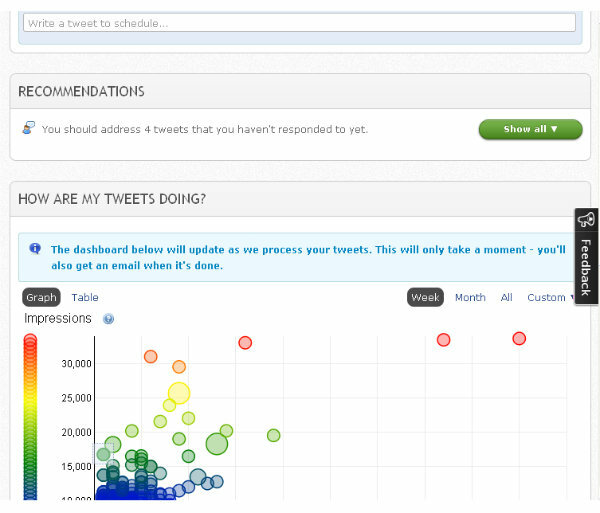 So, to determine how relevant your audience is to where you work, use Tweepsmap. It takes the location details of your followers and plots them on to a map. You can ask for country, state or city breakdown. In the case of the @birminghammail account, 75% of followers are in the UK, 67% are from England and 41% from Birmingham, which suggests the Mail is doing a good job of attracting the right sort of followers. If, however, you were to find you had a very small proportion of people from your area, that’s when you’d turn to tools like Listorious, twiangulate, followerwonk or locafollow to start finding local, relevant, followers. I’m a sucker for a good visualisation of a social network, so crowdbooster.com was always going to be a winner for me. But it’s more than just a pretty graph service. If you’re serious about your Twitter or Facebook presence, either personally or for a brand account, then it feels like a must have. Dealing with the big picture above first – attach it to a Twitter account and it’ll tell you the number of people a Tweet reached, and the number of people who retweeted each tweet. In theory, the more tweets toward the top right of the graph, the better. It does other stuff too. When you log in, it’ll flag up the tweets you’ve yet to reply to, and also list the most influential followers you have (generally the people who follow you who have the most followers) and, perhaps most usefully, the people who retweet you most frequently. Over time, it’ll also build up a picture of when you should tweet to reach maximum audiences. And it does some cool stuff for Facebook too, producing a similar graph for posts – impressions v likes, again, you want to be in the top right of the graph – and suggests when to post updates for the highest audience. It also does something I’ve not seen anywhere else – tells you your top fans based by likes, comments and other interactions. Plug your social networks into Memolane – and by social networks I mean more than Twitter and Facebook, as it does many more such as Flickr, as well as WordPress – and it presents all your entries on a timeline. On a purely practical level, it’s a good way to find everything you’ve every put on all your social networks in one place. On a visual level, it’s also very cool. But there is more to it than that. From what I’ve read – I’ve not tried it – it’s embeddable and you can create new ‘lanes’ and share access with others to build up timelines of specific events or time periods. In one sense, it’s a lot like Tweetdeck in the sense that it has an obvious use, and looks good, but the more time you spend getting used to it, the more valuable you’ll find it. How much do you know about the people you follow and are you getting as much out following them as you thought? That’s the question which Twitclean seeks to answer – and the results can be quite fascinating. It goes through the people you follow and assigns people whose traits it is worried about to certain categories. So for example, people who get put in the ‘dodgy’ category include those who push out mainly app spam, post identical tweets, repeat the same URL or post nothing but links. Of the 1,333 people I follow on Twitter, 32 (2.4%) are labelled under potential dodgy behaviour – and Twitcleaner gives me the chance to select through those people and unfollow them. That said, looking through the list, many of the accounts listed I want to keep following because I want to see the links they are sharing, so Twitcleaner is just a starting point, and I then decide whether to take its reccomendations. Other categories include ‘no activity in over a month’ – which then begs the question whether they’re worth unfollowing if they’re not cluttering up your timeline in the first place’ . The one which catches my eye the most is the ‘hardly follows anyone’ category. A lack of people always suggests to me a brand or person isn’t fully bought in to the point of Twitter, but even then, some of the links are interesting. This was by far and away the biggest category of people I follow – 16.5%. It was also interesting to see a number of media brands I follow were confused as ‘bots’ by this service under the ‘not much interaction’ section. Can there be any greater failure by a brand to be so unresponsive as to be confused as a bot? An interesting tool, and an established tool, but one which needs your decision on the value of a follow in the end. 22. TweriodHere’s a simple question: When’s the best time to Tweet? Type it into Google, and you’ll find many posts talking about, generally, the best times to Tweet. There’s also a lot of advice on repeating Tweets to catch different timezones as they log on in the morning. But tools which just tell you when you should tweet – which is where Tweriod comes in. It analyses the last 200 tweets of your followers and notes when they were online, producing four times of day when you should be tweeting to stand the best chance of catching them. It also breaks it down by day, so you get different times on a Saturday to, say, a Sunday. The times it gives you are based on the timezone set for your Twitter account. You can get regular updates for free, but much beyond the basic service and you’ll be asked to pay a subscription. A simple, but effective, tool all the same. I’ve blogged about Kurrently before, but I’ve decided to include it in this list again, not because I’m running out of tools in this advent calendar (honest), but because I’m still convinced it’s a tool journalists should know about and use. There are plenty of social network search engines out there, but I think this remains one of the most useful, largely because of its simplicity. It is produces results in chronological order for both Twitter and Facebook – an essential factor for journalists looking for information on an on-going news story and also opens up the chance to search via other search engines. One everyone journalist should have bookmarked. Tweetchat is a bit like Twinitor, the first tool I featured on this list in that the idea behind it is so simple, yet it makes such a difference when using it. If you are a reporter covering a council meeting, live event or football match via Twitter and using a hashtag to update, then Tweetchat is the tool for you. 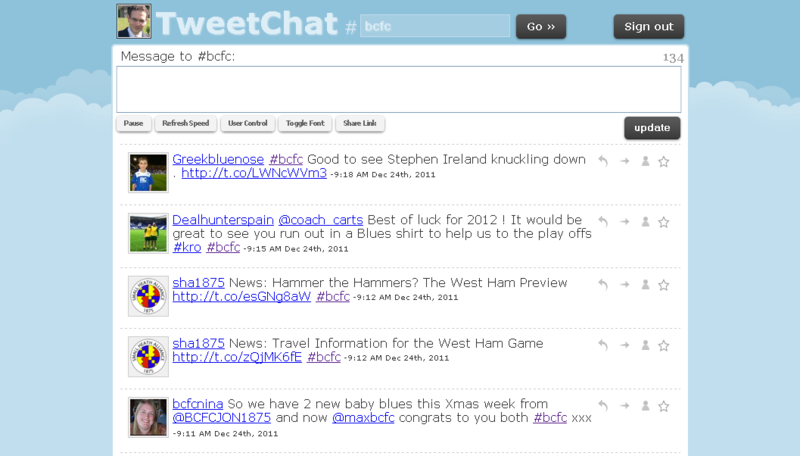 Log on using Twitter and tell it the hashtag you plan to use or follow – in the example above I have used #bcfc, the preferred hashtag for Birmingham City fans. It figures that anyone tweeting about Blues would use this hashtag at the game. It then brings up all the Tweets relating to that hashtag, with a text box at the top where you tweet – it automatically adds the tweet you’ve chosen. You can reply to the tweets dropping in, set the refresh speed, change the font, and block people whose tweets you don’t feel you want to respond to. You can also set it up so that you only pull in tweets containing hashtags from people you choose – which can make it a handy tool for newsdesks on a big job, and much quicker than setting up a standard Twitter list. Of course, some of this you can do on Twitter, but the lightweight-feel of the site makes it much more usable on the move, which is crucial for covering live events. In short, rather than just adding information to the hashtag – which is often what reporters find themselves doing – you are part of the conversation from the hashtag, all on one screen. What’s this Social Media Advent Calendar all about then?